Sword is one of my favourite props. It's not a particularly culturally authentic prop, which is to say that while some Middle Eastern and North African dances do involve swords (or in some of the updated versions, rifles) the way that bellydancers use the sword in the west is not recognisable within the frame of MENA dance. However, it is a very popular prop, it's flash and impressive, balance feats involving swords have a frisson of danger about them and audiences love that. There is also the advantage, when not attempting to create an accurate representation of a cultural dance, that we have the freedom to play, experiment and express our art however we wish. 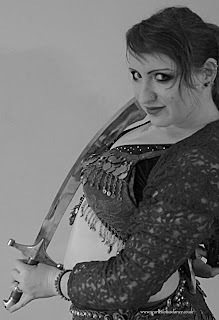 Some dancers use weapons to create martial arts based pieces, Morgana is a great example of a dancer who blends her martial arts background with dance on stage. I have also heard people criticise dancers for not doing this, for not "wielding" the sword "correctly" in their dance for instance. I think this criticism comes from a lack of consideration of what the dancer is trying to say with their dance (or perhaps what the teacher they learned from was trying to say), and I wanted to write a little about how we use weapons in dance, not to represent violence, but to subvert it. I have martial arts training. I fought competitive, full contact Tae Kwon Do and I've trained in Western swordplay. When I dance with a sword, I'm not a fighter, I am a dancer. I don't hold my sword like a weapon, firstly, because it's not balanced like one, it's balanced to sit on my head, but also because part of the purpose of my dance is to take the sword as a classic symbol of violence, death and brutality, and subvert it as something delicate, graceful, even sensual. 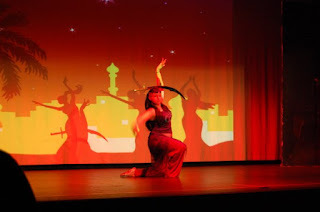 I've heard reports more recently, mostly from dancers in the USA, that they are being asked not to dance with a sword when booked for a performance, the reason being that it might remind people of the atrocities committed by Dae'sh extremists in the Middle East. It makes me intensely sad that anyone would connect a beautiful performance with such things and moreso to see another way that terrorism creeps into our everyday lives. As a counter to this I would suggest that artistic expression, dance, music and particularly the freedom of women to openly participate in the same, are all anathema to these extremists' ideals. Perhaps we are reaching a point where a woman, dancing, in public and subverting the symbol of the scimitar is becoming an act of defiance and ridicule against the perpetrators of violence.